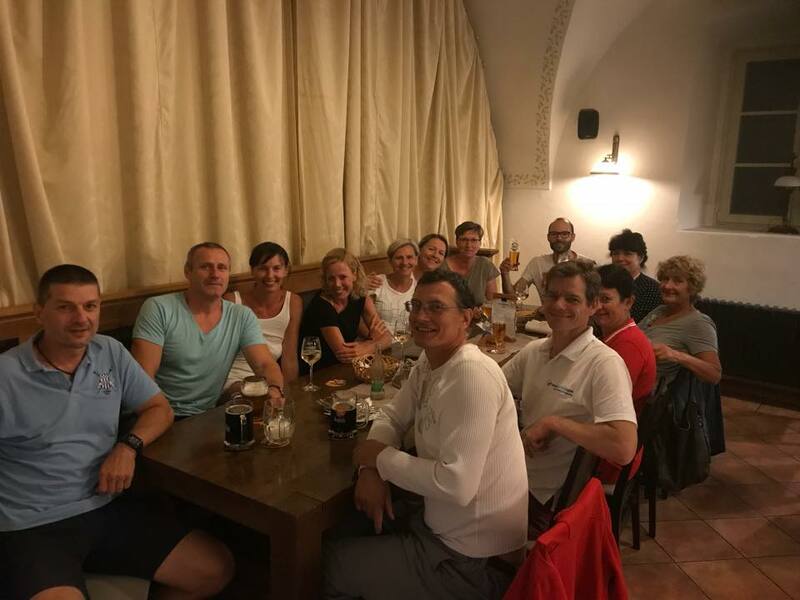 There are a few people missing on this photo, taken on our Friday evening get together in Trebon, but this group of members of CVK Brno, plus a few “affiliates” who have a license to row with us, form the core of the group that was responsible for the largest number of starts on this big regatta. Is it a big regatta? Yes. 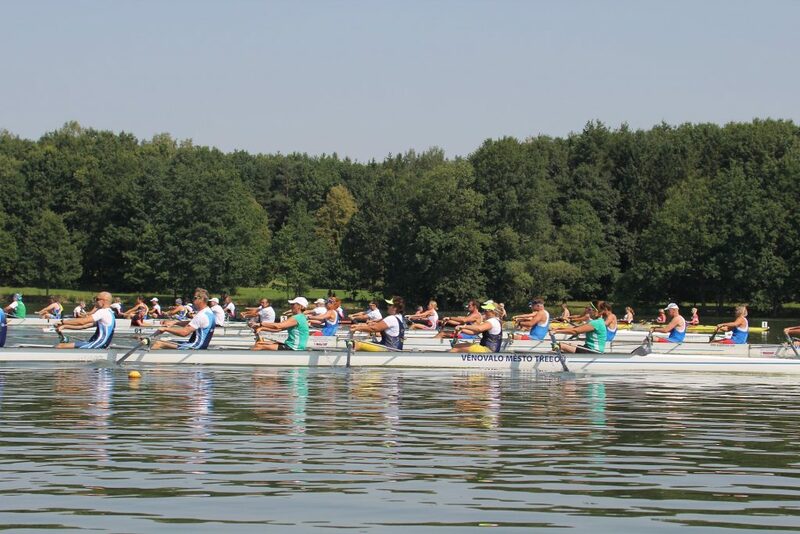 We are not aware of it any more, but our friends from Ruderverein Donaubund (Vienna) do admiringly remark on their blog that this is one of the few regattas in the world where it is taken for normal that there are 17 entries in the Mixed 8+ category. Similarly, in the Men’s Single category, there were 53 entries. Mixed 2x had 39 entries. And the Men’s 2x had 32 entries, which brings us to my first race on Sunday. A few hours before the race, I was sitting in the Ostrava rowing club tent with a few friends and reading them the lineup for my race. 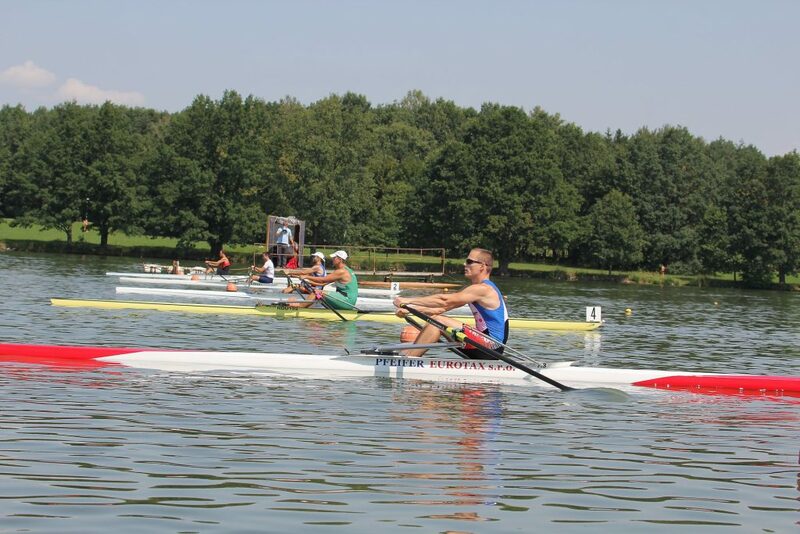 Lane 1: Kazimir & Mitas (nr 1 and 2 in my 1x race respectively). Lane 2: Novotny and Franz from Brandys. Lane 3: Prihoda and Urban from Pardubice. Lane 4: Schreiner & Helbig from Vienna/Graz. Lane 5: Kral & Milodanovic (fastest time in the single with 3:30) from Vienna. Lane 6: Cernak and Roosendaal from Ostrava/Brno. When I finished reading, it was silent for a few moments. With an average age of 49.5 years, we were the oldest of the field. Medal candidates were in lanes 1, 3, 4, 5 and 6. Of all the doubles races, this seemed to be the heat with the most closely matched boats. 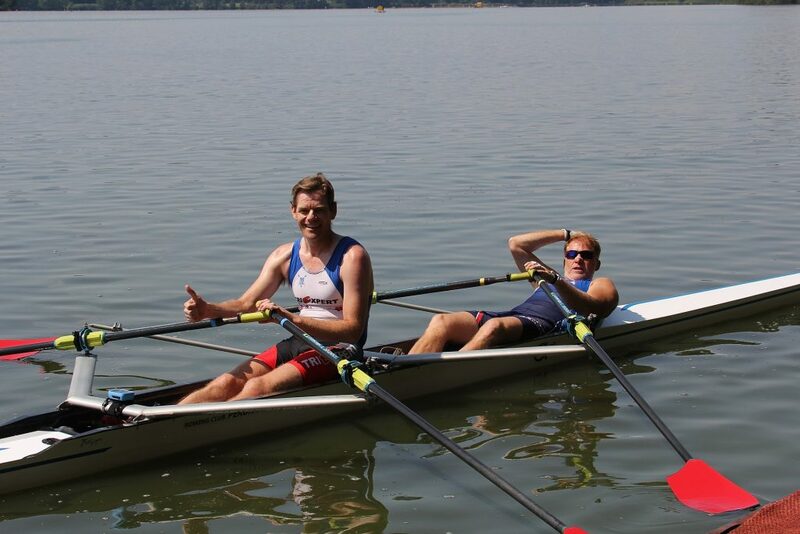 Because we hadn’t rowed much together this year, except for a less than ideal race at the Vienna International Regatta, Vojtech and I had done a 30 minute training with a few practice pieces in the morning. All was well. There are never enough practice starts, so just before the race, we rowed up to the 2k start line, turned the boat and did a practice start. It turned out to be one of the top 3 starts I had ever done in a double. 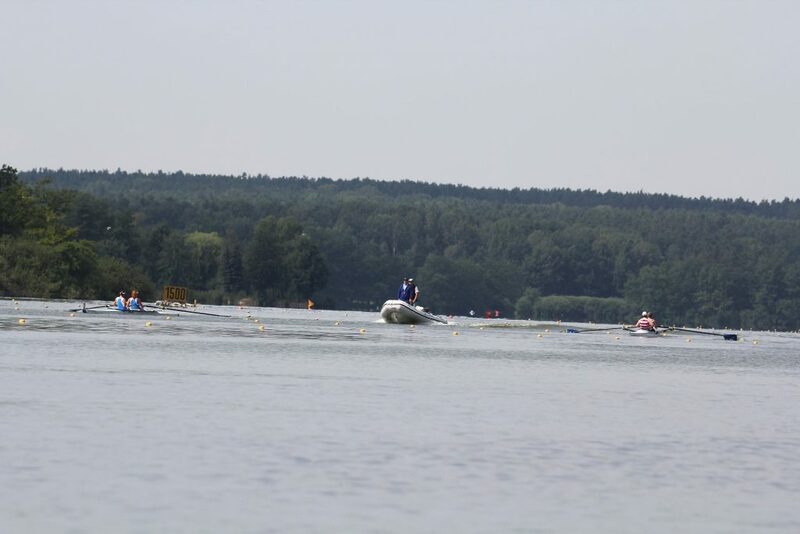 It was so sharp, well timed and fast that there was no chance we would produce a better start at the race, even though the Trebon lake was as flat as a mirror on this hot Sunday morning. Turned out the race start was good. Very good. But of course not as good as that practice start. It also turned out that all 6 boats had a pretty good start. First 200 meters and nobody was moving, except Mitas & Nedoba who were slightly in front. Then Pardubice started to lag behind a bit. With 500m to go Mitas & Nedoba were leading slightly and there were three boats chasing them, including ourselves. So we all started accelerating. Well, all except the unfortunate Viennese double Kral & Milodanovic. It turned out Mr Kral had not completely tightened his wing rigger and it was starting to come lose, so they were limiting the power and stroke rate. 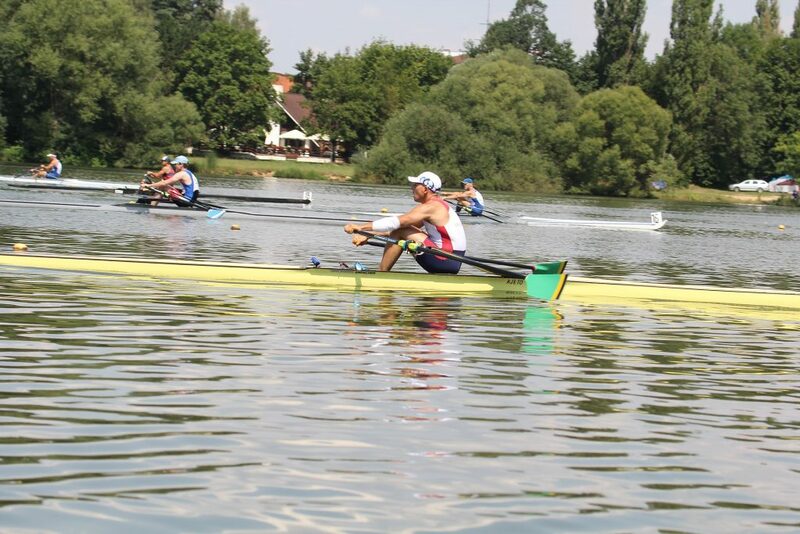 The pictures show Petr and Kazimir leading, with us behind them in lane 6. I don’t know where we were relative to to Schreiner & Helbig on lane 4. I didn’t want to look. 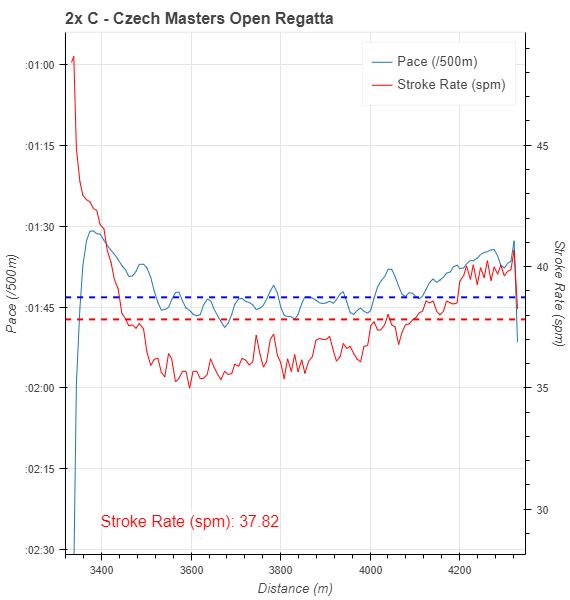 I just kept increasing the rate, just as I had done in two races on Saturday. We ended up rowing the entire final 150m at 40spm, trying to close the gap with Mitas & Nedoba and hopefully also pushing our bow in front of Schreiner & Helbig. The speaker announced a win for Mitas & Nedoba, a second place for us and a third for the Vienna/Graz double. 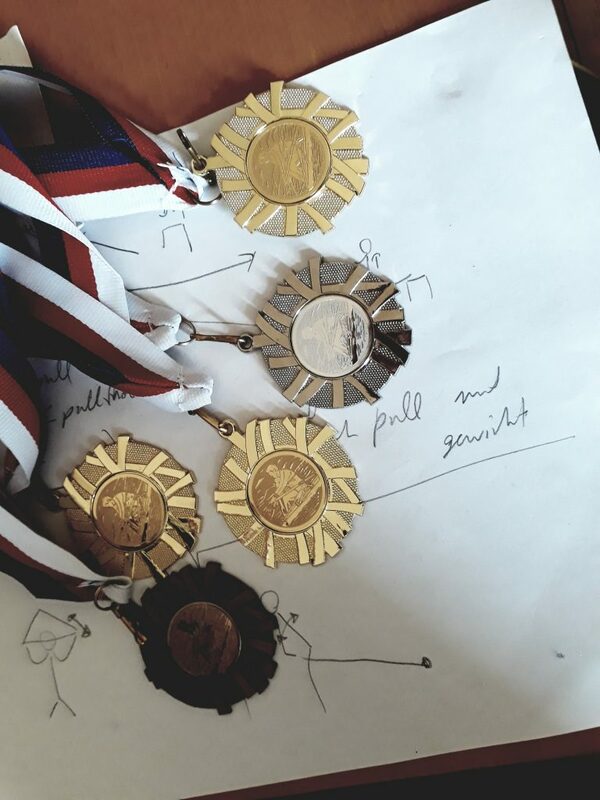 So we cheered for the winners, waited until they received their gold medals, and then landed on the medal pontoon to receive the silver medals. At that point, the ceremony was interrupted by the jury announcing that they were studying the finish video. A few minutes later, there was still no verdict, but they did invite the Austrian double to land on the medal pontoon as well. 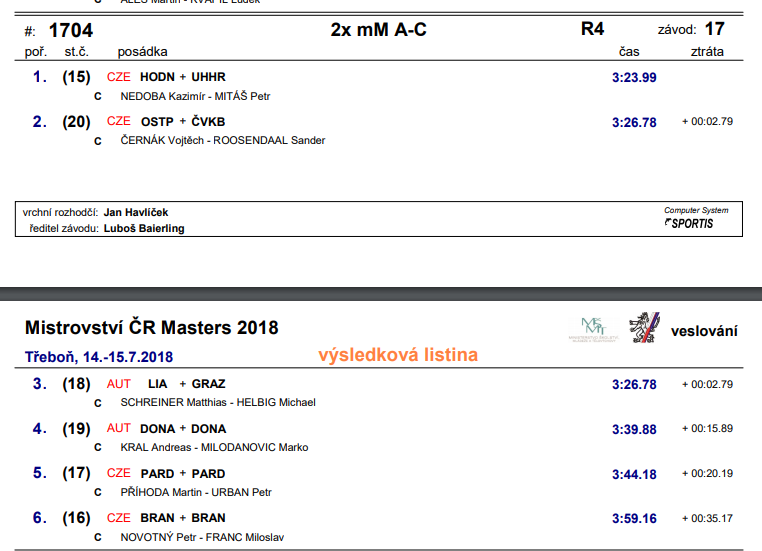 I wasn’t sure if that was a bad sign for us, but somehow I was expecting my luck to be balanced, so after the 0.09 sec lead in the 4x on Saturday and our 0.5 second win in the mixed double, would this be our turn to be 0.1 second behind them? Turns out that it was a dead heat. The official results show it clearly. 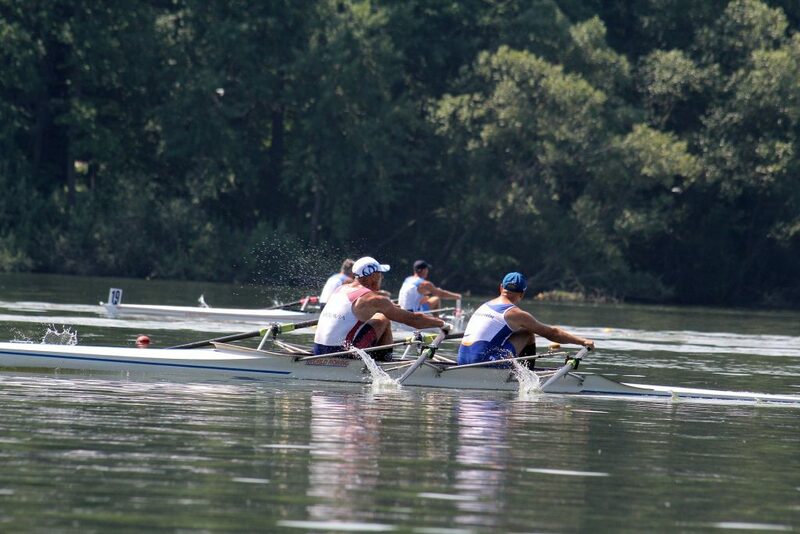 Both boats were exactly 2.79 seconds behind the winners, and both boats would receive the silver medal. According to the regatta speaker, we were the first to achieve this since 1966. I bet the video system wasn’t as advanced back in 1966. What a race! We had good fun with the Austrian crew receiving our medals. 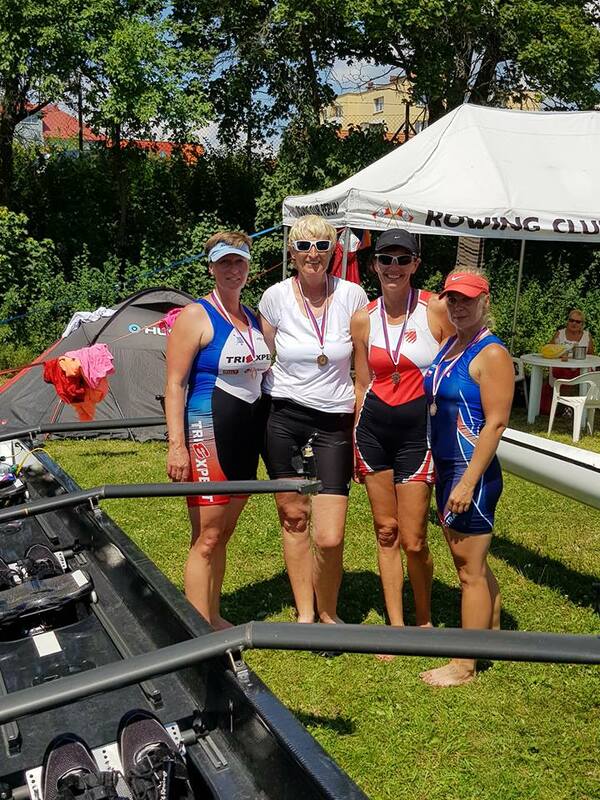 And then we had to row back to the club fast, because Vojtech was also rowing a double with a 82 year old local guy, the oldest participant to the regatta. It was probably a great cooling down for him. My final race of the day was in the eight. There were 7 eights in the C category, so we were divided over two heats, with two B boats added to ours. In principle, we could ignore the B boats in lanes 1 and 2, and focus on beating the other C crews, but our goal was of course to pass the finish line first in this last event. 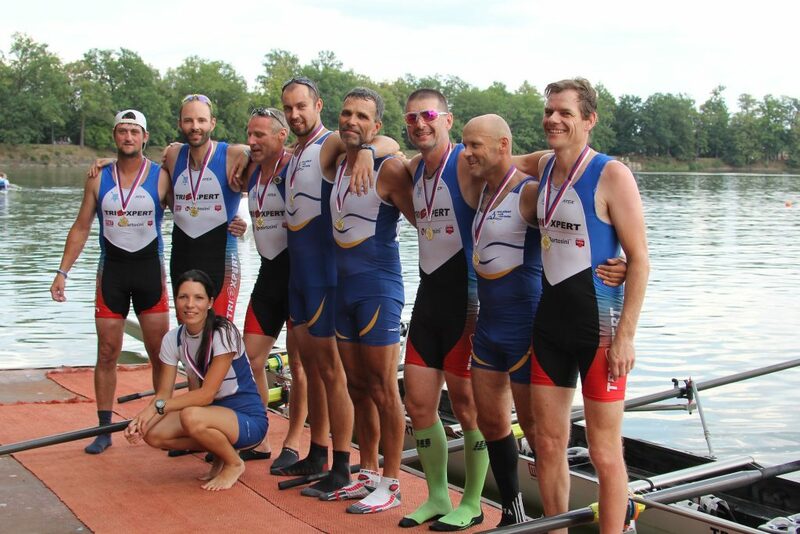 Because of back injuries and vacations, our Brno eight was rowing with four substitutes from rowing club Hodonin. We had Jan Brazda, Milan Viktora, and Kazimir Nedoba, as well as Renata Nedobova, Kazi’s wife and Milan’s daughter, coxing. She was a great coxswain by the way. With a lovely and clear voice she announced dreadful things like “power tens”, but she also gave us info on the relative position of our competitors, on top of calling the catch and finish for timing during the entire race. We were great out of the start but one of the young B boats decided to take the lead. In the final 500m, we did catch up with them but it was not enough. We tried a final desperate scramble for the finish line, but that destroyed our rhythm entirely and probably slowed us down. Still, a gold medal for winning the C race.